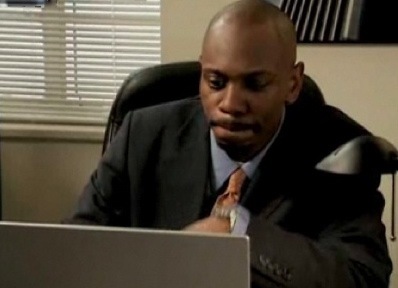 When Keeping It Real Goes Wrong - Vernon Franklin, Screen Shot from Chappelle's Show, December 6, 2010. Donald Earl Collins. Though this image is subject to copyright, its use is covered by the U.S. fair use laws, because this image is used as the primary means of visual identification of the article topic and is of sufficiently low resolution to not be counterfeited. I am applying for the Program Officer, Postsecondary Reform position with the XYZ Foundation, as advertised by the Chronicle of Higher Education UselessJobSite.org webpages the week of 25 October 2010, enabling you to fulfill your EEO requirement by giving you the rare opportunity to interview a Black guy with a Ph.D. who’s not yet middle-aged and your curiosity regarding my career background. My work in the nonprofit sector and in higher education has provided me with significant skills in program development and management, strategic planning, technical assistance, collaboration, and grantwriting/grantmaking, making me a viable candidate for this position, except with The Urban Institute, Social Science Research Council and the American Educational Research Association (AERA), who prefer Yes People to critical thinkers, who want people who look like them or only people they’ve drank a Bud Light with in an important job. My overall work history includes ten years of project management in various capacities with projects funded by the Gates Foundation, the Ford Foundation, and Lumina Foundation. For more than four years I served as Deputy Director for the Partnerships for College Access and Success Program (PCAS) at the Academy for Educational Development (AED). I know that you don’t know what AED is, but please keeping reading, dummies. PCAS was an initiative that assisted community partnerships in addressing college access and success issues among low-income youth and youth of color nationally. This work put me in contact with school administrators, college presidents and deans, high school and college students, and executive directors of nonprofits. Yeah, I know I haven’t done much work with boards, CEOs and admissions officers, but don’t you think it’s idiotic to suggest that I’d need to work with all of these people in order to manage a project? Over the past thirteen years, I have also honed my curriculum development skills as either a project manager or adjunct professor. This includes my work as an adjunct professor at Carnegie Mellon University, Duquesne University, George Washington University, and the University of Maryland University College. But I know that none of this matters, since I haven’t taught at nor attended an Ivy League school (at least as a full-time faculty member – I did teach at Princeton for two summers). I have taught undergraduate and graduate courses and worked with talented high school youth, first-generation college students, adult learners and graduate students. What? Never been chair of a department or have managed a student’s dissertation process? I guess having taught 2,000 students since 1991 has made me as inadequate as you. My work history also includes five years of technical assistance — I know, I know, what’s that? It’s acting like a strategic planning consultant, except I actually know what I’m doing work through AED New Voices and AED PCAS. I also possess seven years of experience conducting research-based interviews, developing interview and survey instruments and protocols, developing profiles and case studies, and coding qualitative research. But you dumb asses only want to hear about quantitative research, crunching numbers, multivariate regression analysis, as if this is the end-all and be-all of doing work on education reform and social change. God, being able to tell people what these numbers mean is so much more important than the numbers themselves, but you Vulcans won’t listen. ▸ Previous experience in conducting a grantmaking process, including a request for proposals, selecting a suitable selection committee with extensive academic/professional knowledge and field experience in their respective fields, and sending members of the selection committee out in the field to interview the potential grantees. What? I’ve never worked for a foundation? My bad – I thought that skill sets were transferable! Oh, that’s right – I lack the I know lots of important people skill set! ▸ With PCAS, foundation relations/fundraising work raised $1.2 million for PCAS. Surely I should’ve raised more, right? At least $10 million? But I know you won’t hold that against me, right? Yeah, right! ▸ Have published works on multiculturalism and diversity, race and identity, education, and social justice including my book Fear of a “Black” America: Multiculturalism and the African American Experience (2004) How scary! Another angry Black male sticking it to the Man with a book about diversity. Of course, this shows how little people who react to the title think about educated folks of color anyway, looking for any excuse to confirm their own ignorance as wisdom, as well as articles and reviews in Black Issues in Higher Education, The Washington Post, History of Education Quarterly, Radical Society, Teachers College Record, and Academe Magazine. Dude, you’ve fallen short — where’s your New York Times op-ed or Atlantic Monthly piece? I believe that my experiences in the nonprofit sector make me a qualified candidate because they have provided me a rich understanding of nonprofit management, social justice, policy advocacy and program development in the transition to higher education. I look forward to hearing from you soon. But in some cases, I’d die from asphyxiation trying to hold my breath. I’m hardly bitter about my experiences in the job market. But working with people who are clueless, dishonest and obfuscate at every turn can make looking for another job frustrating beyond belief. Maybe this is too honest, even for me. In the past seven years of applying and interviewing for a bunch of jobs, I’ve learned so many times after the fact that I wasn’t selected because I wasn’t a friend of the director or a certain senior program officer. It’s not what you know, it’s who you know, they say. Which explains why there are so many people with questionable skills in high responsibility jobs.